I have never gotten familiar with any eyeshadows from Maybelline. I know that some shades can either be a hit or miss among some, but nonetheless, I decided to pick up the Maybelline Eyeshadow Quad in Sunlit Bronze ($6.49) on my most recent trip to Duane Reade drugstore. 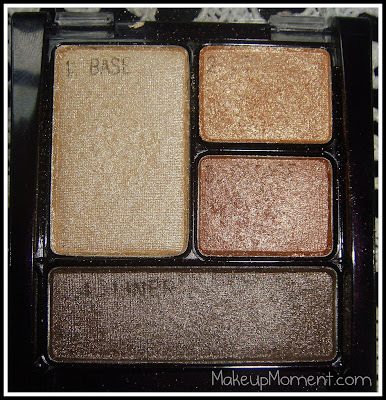 I am a lover of all things bright, gold, and bronze, so this eyeshadow quad was right up my alley. I am sure you all have noticed that all of the shadows are shimmered/frosty. But it's a little too much. 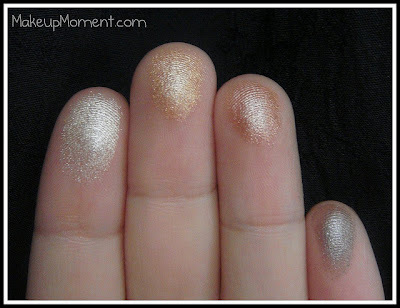 When it comes to pigmentation, when swatched, the shadows show a decent amount of color. But when I apply it on my lids with my Urban Decay Primer Potion underneath used as a base, the pigment is a bit underwhelming. It is not as intense as I hoped it would be. Although the pigment isn't as prominent, the shimmers are. I have not tried applying the colors wet, so maybe that would work better? On a good note, application is great. The shadows are soft in texture and apply and blend like a dream. I did experience a tiny hint of fallout though, so I make sure to pat on the shadows to help prevent this. My favorite colors of the bunch are the champagne and medium gold. I like to apply the gold color all over the lid and then use the base color as an inner corner highlight. The bronze color is nice too, but when I apply it next to the gold or on the crease, the bronze sort of disappears into the gold when blended together. But I must warn those of you who are not too fond of shimmers-steer clear of this eyeshadow quad. The shadows are shimmer overloads. Luckily for me, I actually like sporting shimmered shadows in the daytime to school ( It makes my eyes pop, and helps brighten them up-great for those tired mornings), so it is not really a factor for me. I like that the shadows have little imprints on them, and an illustration and directions on the back of the packaging, showing where to place the color. Takes the guesswork part out for you. The packaging is nice and practical, although the plastic feels a bit flimsy. I like the clear flip open lid which let's me see the shadows. It is also very handy that included are two sponge tip applicators, which are great for when one is on the go. I am happy to report that the shadow colors are pretty long lasting on me (when used over an eyeshadow primer). There is no fading, and very minimal creasing by the end of the day. 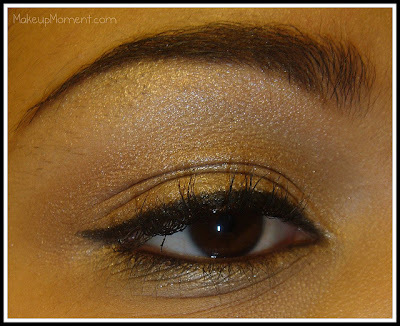 I applied the champagne color on the inner corners and brow bone, the gold all over the lids, the bronze in the crease, and the taupe on the outer lower lash line. You may not be able to tell by this picture, but believe me, the shimmers are very much there. LOL! 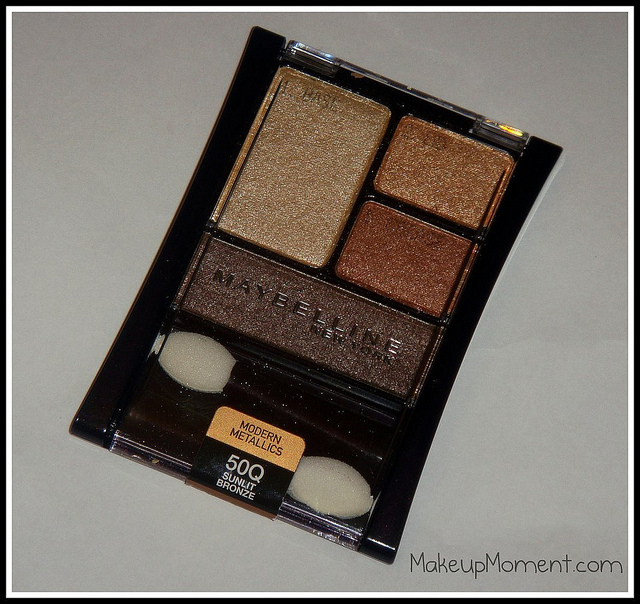 Although I was left a bit underwhelmed with this eyeshadow quad from Maybelline, I do see myself using this quad for everyday use, and I am sure these shades would be great for the warm, summer months when I want hints of shimmery gold on my lids. 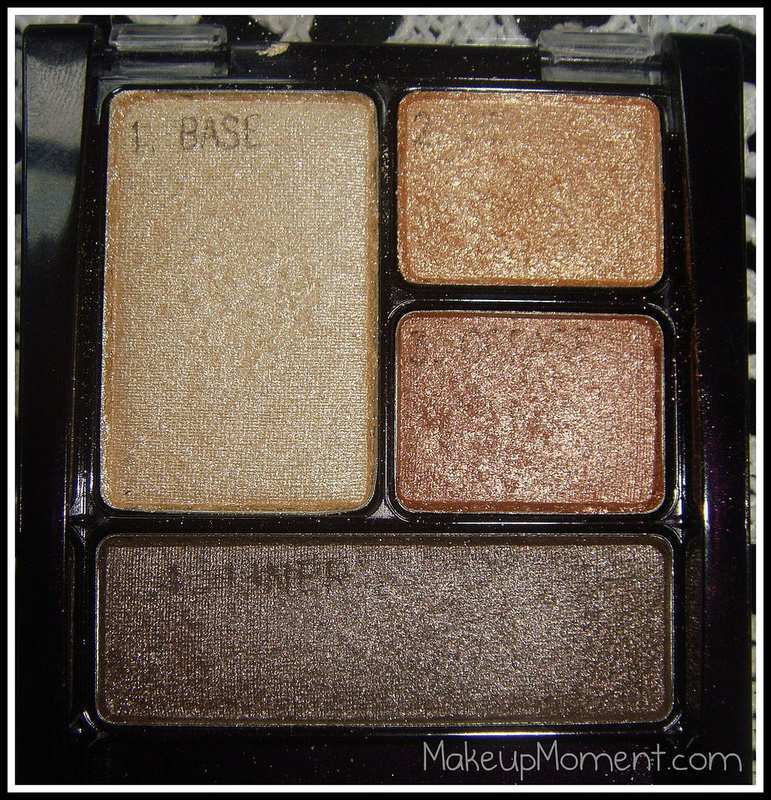 I would not re-purchase this particular set of shades again, but I do still want to try other quads in the Maybelline Expertwear Eyeshadow line. I will probably check out a smokey eyeshadow quad next. Have any of you tried this, or any of Maybelline's Expertwear Eyeshadows? Let me know in the comments section, I would love to hear your experiences. I have this quad in the original packaging and find it very glittery, but the colours are pretty. I had to stop myself from buying it again when I saw it at Walmart. Yea! I noticed that the packaging changed. I think the old one used to be in the blue one. I like this new packaging better. It looks a bit more sleeker. And yea, I am a sucker for these colors too. LOL! Have you tried any of the other shadows in the Expertwear line? Any you recommend? Hi darl, last time I tried maybelline eyeshadow was years ago and tell you the truth I was underwhelmed as well, just not enough pigmentation. But their foundations are a different thing, i only really use their foundations as the colours work well for me. Thanks for the swatches though! I guess I am not the only one that was left a bit disappointed. But I am not giving up hope. I have heard nice things about Maybelline's smokey eyes quads, so I am looking to check them out in the near future. Have you tried Maybelline's new Fit Me foundation? I can't wait to try it. It looks great!